Modern Tree, one of my works made for the exhibition titled Twin Peaks, was organized by Seoul Museum of Art in 2011 to look into the societal and environmental damage as a result of South Korea’s rapid industrialization from 1970s to 1990s. 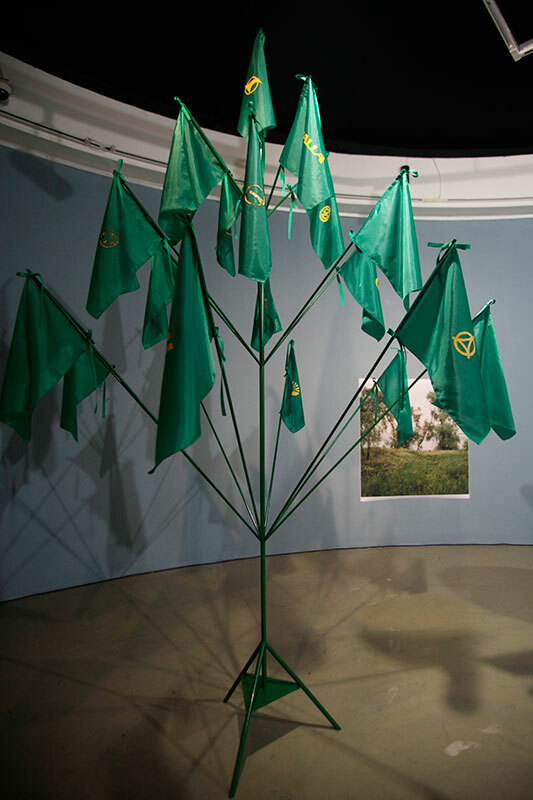 It is a sculpture installation composed of the green flags of Saemaul Movement (New Village Movement of the 1970s under the Park Chung Hee’s reign, a symbol of the movement to encourage workers to work long hours and long work weeks to build the national economy). 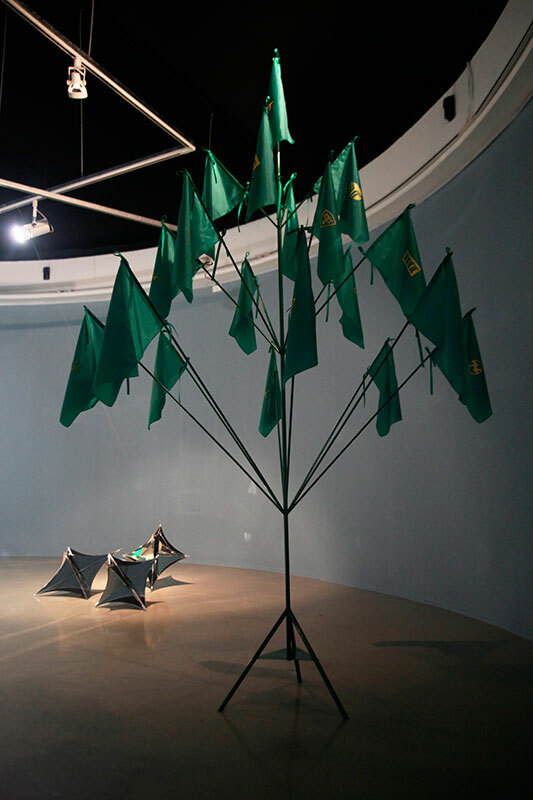 In my work, the symbol of the Movement on the green flags was replaced with logos of major corporations in South Korea, and installed onto a metal stem like branches of a tree. This work is intended as a meditative space to offer rest and consolation, in memory of the generations who participated in the rapid economic development and suffered as a consequence. 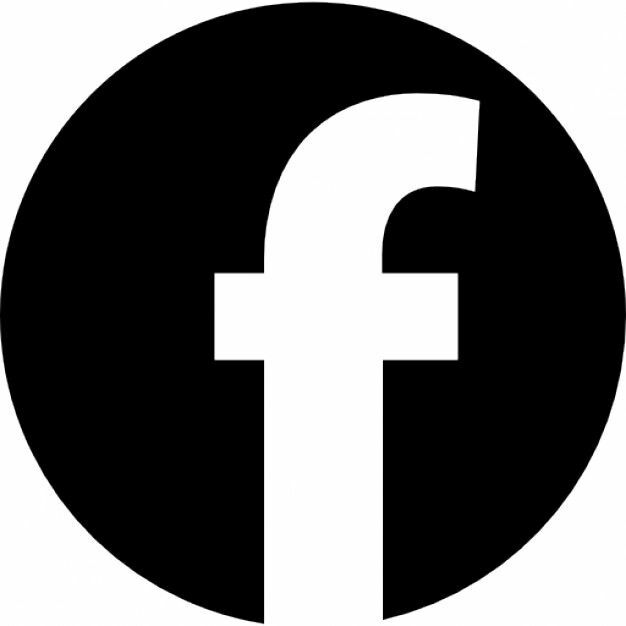 The extreme rapidity and force of the economic development plan was only accomplished with much suffering. 는 지난 1977년부터 1992년까지 쓰레기 매립이 이루어진 '난지도'를 매개로 한국사회의 산업화 과정에서 드러난 다양한 형태의 상처를 들여다보고, 이를 통해 현재 혹은 미래와의 연결지점을 상상하고 이를 극복하고자 기획되었던 'Twin Peaks(2011, SeMA난지갤러리)'전에 발표된 작업이다. 이 작품은 한국전쟁이후 남한의 근현대화가 진행됐던 시기의 국가 기간산업을 담당했던 대표적인 플랜트 기업로고를 당시 '새마을 운동'의 상징기호로 변환하여 정방향 대칭철제구조에 깃발로 매달은 구조를 취하고 있다. 는 한국사회에서 근현대 성장기를 지나치며 제시됐던 나무모델의 상징계라 할 수 있다. 작가는 이 작업을 통해 지난 과거, 개인의 목소리와 존재감이 국가의 정책에 의해 철저히 외면되고 무시되어왔던 시대의 상처를 치유하고, 이들에게 위안과 휴식을 주고자 하였다.